How amazing is it that we USers had the good sense to save this patch of woods! Here in this State Park, hidden (I love that; this stand's location is "undisclosed.") somewhere amongst these awesome giant first growth Redwoods, there is a stand of the tallest trees in the world. 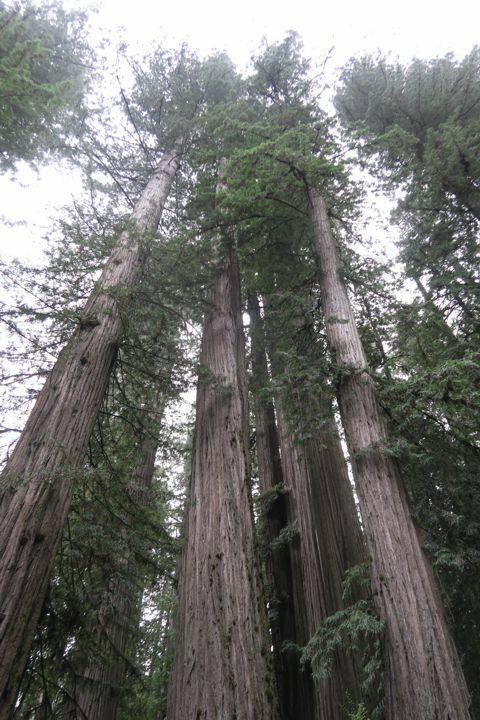 One of these trees is over 379 feet tall – something like 75 times as tall as me! – and no one knows how old. Snaking along this "secret" byway, feeling very small, is one of the scenes that sets our stage every year for the magnificence of theater in Ashland. Purely magical. So tall that their tops vanish in the fog, the woods so silent that the plish-plash of the rain is audible, I am reminded that this patch of living earth is really at the heart of what matters to me ... to us, I think, even though in the clamor and haze of politics, such things are eclipsed by the immediate yet unimportant. 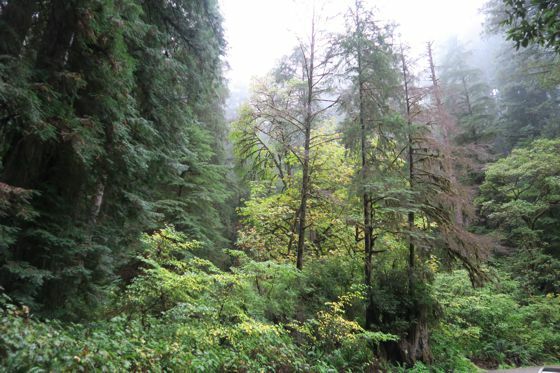 The tourism flacks proudly tout our region as the Redwood Empire, but, like the Pacific Ocean, we who live amongst all this healthy natural beauty sometimes forget to look ... and appreciate. Appreciation: our least expensive, most endangered resource! The ride from Caspar to Ashland first runs along one of the places where the Pacific Plate is actively subducting, and the continent is falling into the sea. The road is falling along with it, and all along yesterday's ride, we were held up by bits of one-way road, where crews were lackadaisically working on fixing them before winter comes ...and takes them away some more. Imagine: mighty Highway 101, the coastal route from San Diego to the Canadian border, is a one way road! Looking on the bright side, it sure slows things down. We're listening to a lovely audio book, The Reluctant Midwife by Patricia Harman. Got it from the library ... just one more great thing that an effective government does. Gills was picturesque, but the food was greasy. 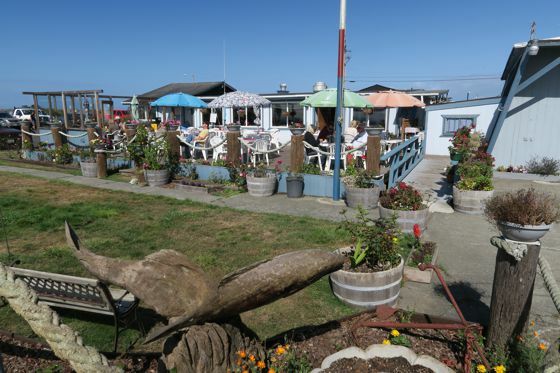 It's kind of amazing that this place has the best location in Eureka, but not anything to eat! We both groaned and held our guts the rest of the way to Crescent City, past several more one-lane sections of mighty 101, and finally limped down the hill (one lane where it used to be four) into the Redwood Empire's last "outpost of (questionable) civilization." We had a crab louie for dinner, and a restless night, before heading up Howell Hill Road to our magical encounter with the miraculously preserved Redwood Giants. Once through the magical Redwoods, it's One-Windy-Nine over the Siskiyous and into Oregon through rain and then moments of sun and rainbow. Into Ashland in time for a leisurely lunch at Tot (not worth a picture): for me, a fiery Kim-chi Noodle Soup, and a soothing Mushroom Crêpe for Rochelle, who is still paying for yesterday's greasy lunch. We check into "our room" – same as last year's apparently reserved for Best Western members, of which Rochelle is one. And then, what we came for: a play. First, we're disoriented by the swift translocation from quiet homey Caspar to the cultural mecca of Ashland. Always before, we arrive one day, get acclimated, and then plunge into culture the next day. Not this time. 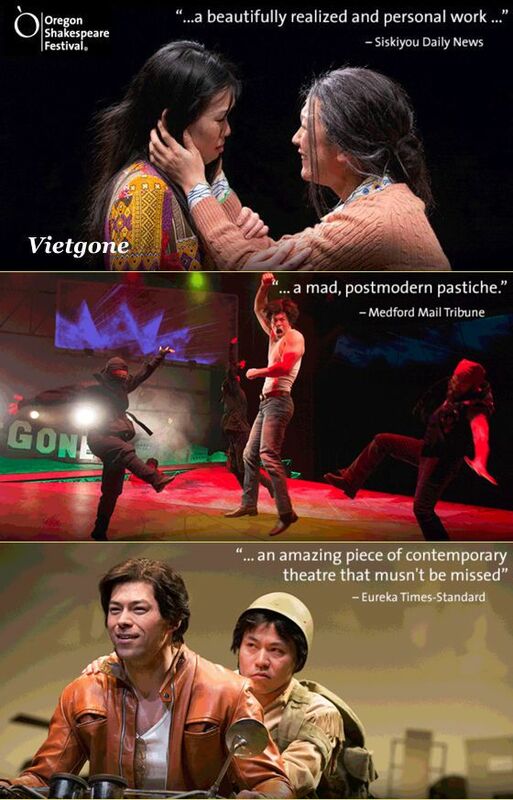 And then this play, Vietgone, is about the shock experienced by the Vietnamese who came in droves to the US in the late 1960s. The play, written by a first generation Vietnamese-American, was magnificent. Good plays make you think; this play made us think about the dislocation and strangeness experienced by these Asians, who lost their country, as well as, too often, their families, their brothers ...and came to a country where they were mistaken for the enemy and immersed in a nation reeling from the loss of incalculable wealth and a quarter million of our brothers and sons and friends and neighbors. And this is only our first play! On the way out, Rochelle says, "Bet this is our best play!" While I hope not, it's hard to imagine anything better. We see our friend Jacki Rovin as we leave the theater. She wants to know what else we're seeing, tries to steer us away from one I want to see – "great acting, but I hate the staging" – and wants a Caspar report. We won't be able to see the play she suggests, Roe, because we have a full dance card. We tell her about our friend who wanted to see Vietgone, Roe, and also be in Maui. "Sounds like Annie Lee..." says Jacki. 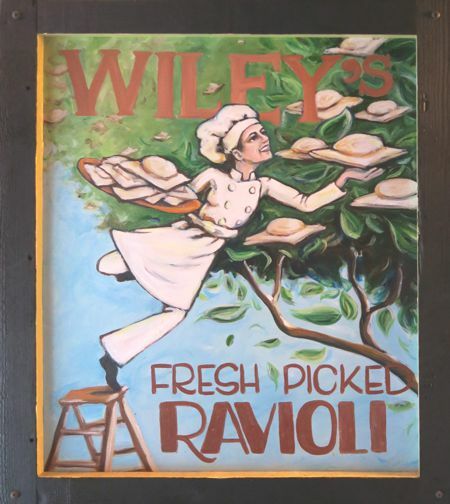 We had the night "off" and so indulged ourselves in a visit to our long-term favorite Ashland dinner, at what used to be Wiley's World, now reinvented as Wiley's Trattoria. Wiley has enlarged and reinvented his World in the last year ... and with a very good result. 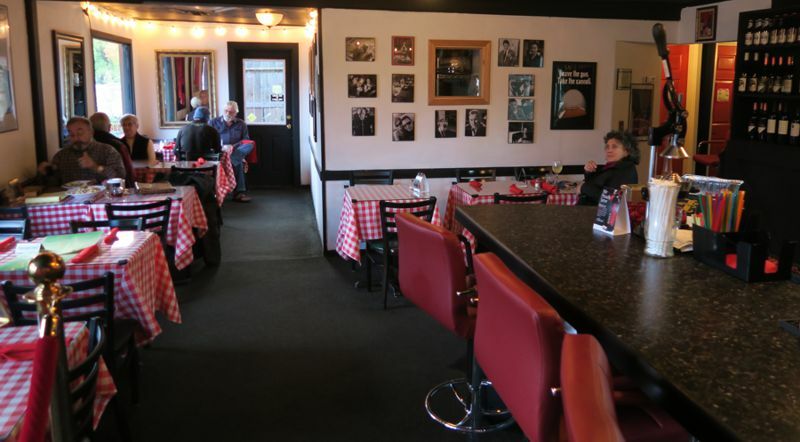 The food is just as good, and no less affordable. Honest ingredients generously and skillfully prepared by a skilled chef and cheerfully served by Southern Oregon University co-eds. Our salads were interesting, not the same-old-same-old iceberg and pseudo-tomato.  The special – we always go for the special! 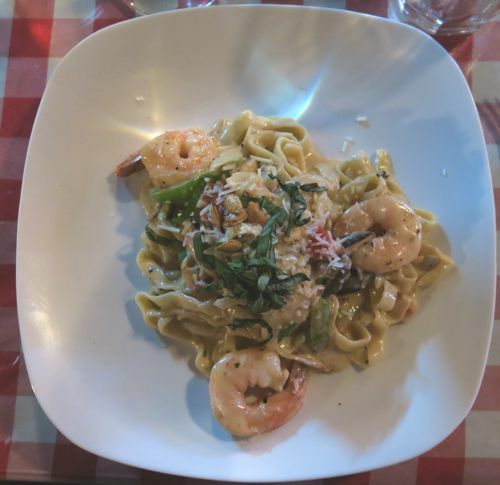 – Oregon Bay shrimp over fettuccini in a sherry cream sauce, was delicious, the pasta exactly on point and the sauce rich but not unctuous. (That's half an order in the picture, just enough for us.) Luckily, we still had room for Wiley's delicious light chocolate mousse. In a town with puffed-up eateries intended to fleece the play-goers, Wiley's is worth a short trip uptown. We're so glad we found it, years ago, and you can bet we'll be back. Two regrets: the smaller order of pasta is no longer available after 2:30 ... and pasta to go isn't available any more.